1.Multiple Themes Module:CryptoKing comes with 6 varieties for themes and a future ready setup for upcoming themes. You can select your favourite theme and go live in seconds. 2.Multi Currency Module:Cryptoking supports more than 2000+ Currencies. Right from Bitcoin to Ripple. 3.Multi Language Module:Users can switch the site into any language, Admin has a privilege to add any language. Ex: English,French, German…etc,. 4.Live Trade Feeds Module:CryptoKing will fetch the live data of coins from over 90 cryptocurrency exchanges. 5.Detailed Charts Module:Sparkline, line,bar and many other charts are available to pull the coins data hourly, daily and weekly. 6.Coin Information Module:CryptoKing provides detailed information for each coin like Summary, website, key numbers, historical quotes. 7. Trending Coins Module:The site will pull the trending coins based on the market cap. 8. Currency Calculator Module:Convert any currency into any currency at live rate. 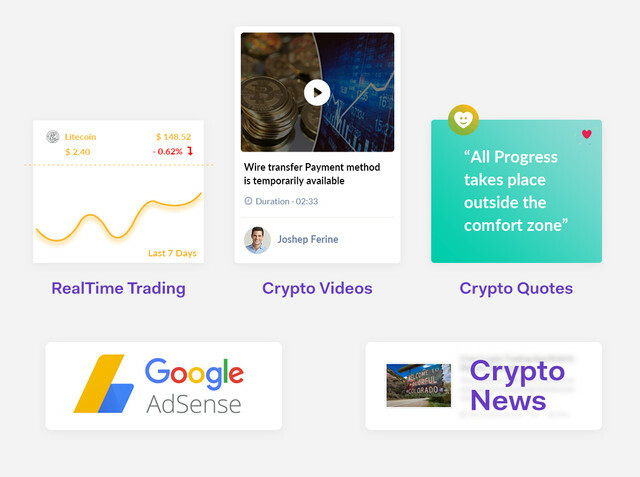 9.Google Adsense Module:CryptoKing fully integrated to with Google Adsense. Admin can add ad code and can start earning in seconds. 11. Affiliate Links MOdule:Earn extra money besides Google Adsense with Changelly You can add links at admin end. 12. SEO Module:CryptoKing is SEO optimized and compatible for RICH SNIPPETS.Your URLs looks pretty on Social Networks. 1. Site Settings Module:You can easily change the Site Logo, Favicon, SEO Details and many other settings. 2. Payment Gateway Settings Module:Add your Stripe and RazorPay Settings easily in admin. No need to touch the code. 3. Language Settings Module:Add your language strings and make the site live in any language. 4. Ad Settings Module:Get Google Adsense code and paste into the Ad Settings,Ads will display on the site. 5. Social Settings Module:Add your Facebook, Google secrete keys for social logins into the system. 6. Theme Settings Module:Admin can set the desired theme from 6 pre-build themes. 7. Users Module:List all your users registered in the site.